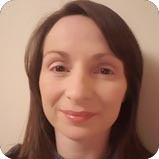 Sue completed her four-year Advanced Diploma in Humanistic and Integrative Psychotherapy with the Tivoli Institute and is currently complementing her studies with a Clinical MA in the same discipline. She also has a number of certifications in Suicide Awareness and Prevention Training. Sue works from a client-centred approach, incorporating differing therapies and methods depending on the client’s needs such as Gestalt, Psychodynamics and Psychosynthesis, decided upon in consultation with the client. She offers individual therapy to adults and has particular experience in working therapeutically with depression, anxiety, adult children of alcoholics and adoption-related issues. Sue spent over ten years in education before training in Psychotherapy, having worked with both adults and adolescents in this capacity. She has worked in mainstream, further education and support services for those returning to education after long-term unemployment. Within this capacity and through her voluntary work with a number of charities offering Mental Health support services, she gained valuable insight into the impact of unemployment, addiction, criminality and homelessness upon a person’s mental health and their interpersonal relationships.